Though my reviewing efforts usually focus on recent releases, every now and then it feels good do break my own rules. This review should have been published three years ago on a different website, but, unfortunately, circumstances dictated otherwise. Almost unexpectedly, the opportunity for writing this long-overdue piece came barely over a month ago, when I had the privilege of seeing Frogg Café perform at the NJ Proghouse Homecoming Weekend – a triumphant return to the stage after years of absence, and hopefully not a one-off. Born towards the end of the 20th century in the New York metropolitan area as a Frank Zappa tribute band named Lumpy Gravy, Frogg Café have been through their share of lineup changes. However, their fifth studio album, Bateless Edge – released in the early summer of 2010 – saw the return of their original lineup (including guitarist Frank Camiola), augmented by trombonist John Lieto, who had appeared on their double live CD The Safenzee Diaries (2007). Although highly anticipated albums may often disappoint expectations, this is definitely not the case of Bateless Edge – an effort as monumental in scope as the odd-looking contraptions gracing its stylishly grungy cover in muted shades of grey. With the band’s six-piece configuration expanded by a host of guest musicians (including Steve Katsikas of 10T Records label mates Little Atlas) contributing a wide range of additional instruments, it is no wonder that Bateless Edge sounds big – symphonic in the true sense of the word. 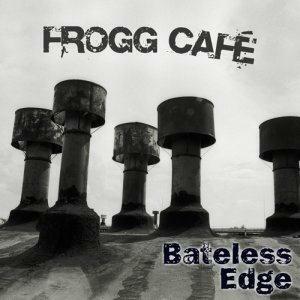 Indeed, in spite of the generic jazz-rock tag often attached to them, Frogg Café might be effectively described as the link between brass rock in the style of early Chicago, Blood, Sweat and Tears and Colosseum and progressive rock proper, with frequent forays into more experimental territory and a healthy balance between loose-textured jams and tighter, more disciplined compositions. With a running time between 6 and over 20 minutes, the six tracks on Bateless Edge well represent their authors’ different personalities. Frank Camiola’s two ambitious contributions reflect his fascination with the more left-field fringes of the progressive spectrum (well displayed in his side project Cardboard Amanda’s eponymous 2006 album). The amusingly-titled “Pasta Fazeuhl” (inspired by Magma’s appearance at NEARfest 2003) is a veritable rollercoaster ride in which angular Frippian guitar forms collide with brooding, cello-driven passages reminiscent of Univers Zéro and hauntingly military marches in true Magma style, with brief yet intriguing classical touches, freely blaring horns and wild bursts of guitar. Album closer “Belgian Boogie Board” was originally written in minimalistic form for the Cardboard Amanda album, but was then expanded and rearranged as a 28-page score involving almost as many instruments – a true tour-de-force that might easily be described as RIO meets brass rock, a joyful instance of controlled chaos. Nick Lieto’s contributions, in stark contrast with Camiola’s, are definitely the most accessible on the album, emphasizing melody and a bright, upbeat mood. In the instrumental “Move Over I’m Driving”, Bill Ayasse’s sprightly violin and mandolin introduce folksy elements in its choppy, dance-like pace, to which the horns add a quasi-orchestral quality, and all the instruments take turns in a call-and-response pattern. On the other hand, “From the Fence”, for all its 12-minute running time, is the closest the album gets to a conventional song with a lovely, easy flow enhanced by Lieto’s expressive vocals and memorable, almost Beatlesian chorus; Ayasse’s stunning violin turn lends an appealing Old-World feel to the piece. Andrew Sussman’s own two pieces bring those two strains together, with plenty of variety and a hint of an edge to temper the melodic quotient. “Terra Sancta”, dedicated to the children who lost parents in the 9/11 bombings, opens the album in authoritative yet catchy fashion (at odds with the stark, poignant lyrics), driven by buoyant horns and spiced by Eastern instruments such as the tabla and Indian slide guitar. A more somber, slightly dissonant section in the middle breaks this deceptively upbeat feel, with the guitar launching into a very expressive solo before the reprise of the main theme. The second of Sussman’s compositions, “Under Wuhu Son”, is a three-part suite with another deeply emotional story behind it (this time a very personal one, as it refers to the musician and his family’s struggle to adopt a little Chinese girl), and acts as the album’s centerpiece also in a literal sense. The wistful, elegiac tone of “In the Bright Light”, intensified by lyrical violin, flute and marimba, segues into the surprisingly intense, metal-tinged riffing and forceful horns of the instrumental “Left for Dead”; then the intensity eases with the jaunty, melodic “Brace Against the Fall”, featuring a lovely guitar solo that shows Camiola’s more sensitive side. Although my regular readers know that I am generally very critical of albums that I perceive to be excessively long, I will make an exception for Bateless Edge – the only album I have heard in the past few years whose almost 80-minute running time hardly has any negative impact on its quality. While there might be a bit of self-indulgence here and there, the overall level of the music is so high that those occasional lapses can easily be overlooked. With its tight musicianship and eclectic compositional approach, Bateless Edge celebrates the pleasure of music-making by offering the sonic equivalent of a lavish banquet. Though most dedicated prog fans will already have heard the album by now, those who have missed it would do well to give it a listen – or possibly more than one, as this is easily one of the best releases of the past few years.